If you’ve occasionally driven down Needham Street in Newton over the course of the last few years, you’ve witnessed the start of a metamorphosis. This commercial strip has been historically characterized by isolated retailers and a hodgepodge of office buildings and light manufacturing. But over the course of the last decade the consolidation of certain parcels and the general pressure to develop land for maximum return on investment has fostered an opportunity whereby Needham Street could evolve from a classic commercial strip into a genuine walkable and vibrant street. As an urban planning diagram, the Needham Street environs is confounding. While it stretches enviably between route 9 and route 95 and the Green Line, an overlay of major arteries and nodes shows that the connection points are constricted, strained or just incomplete. While most of these can be overcome with time and thoughtful planning, it is heartening that the impetus of the evolution of Needham Street stems from the people who shop, work and reside in this area, and who are demanding more from the settings that they live, work and shop in. Thankfully that demand is trickling up to today’s savvy developers who are responding with projects that value placemaking as an essential design objective. There is probably nothing more antithetical to placemaking than large swaths of lawn separating the sidewalk from buildings that crave and need street engagement. This was more or less the norm on Needham street until recently when the developers of projects like Needham Street Village Shops (Bierbrier Development Inc.), 170 Needham Street (The Growth Companies), 180 Needham Street (Crosspoint Associates, Inc.), and now the Newton Nexus (also by Crosspoint) put forth proposals that engage the sidewalk directly with building mass, outdoor dining and landscaping that focuses on inviting patrons rather than buffering fast moving cars. The result is a street section that creates a contained, walkable outdoor room such as one finds in good cities and towns. Walnut Street in Newtonville makes a good comparison as it is both a major thoroughfare, and also a village center. The evolution of Needham Street into a place rather than just a drive by strip will depend on not just engaging, street-focused site design, but also the development of high density housing options. Avalon at Newton Highlands started that ball rolling several years ago. 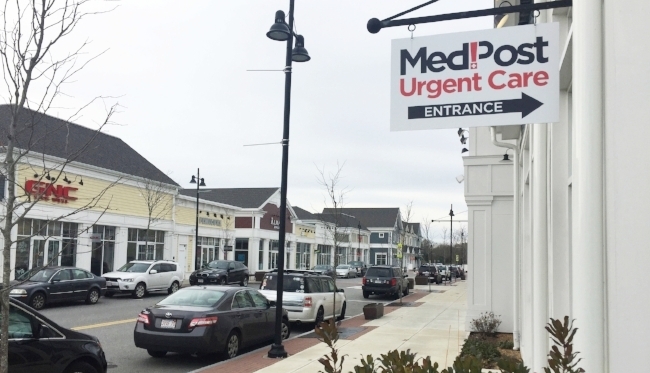 It seemed a pretty perplexing development at the time, but now as the neighborhood evolves, it seems like Avalon was ahead of the curve in seeing the underlying potential in Needham Street. This hasn’t been lost on Northland Development which has proposed the biggest plans unveiled yet. 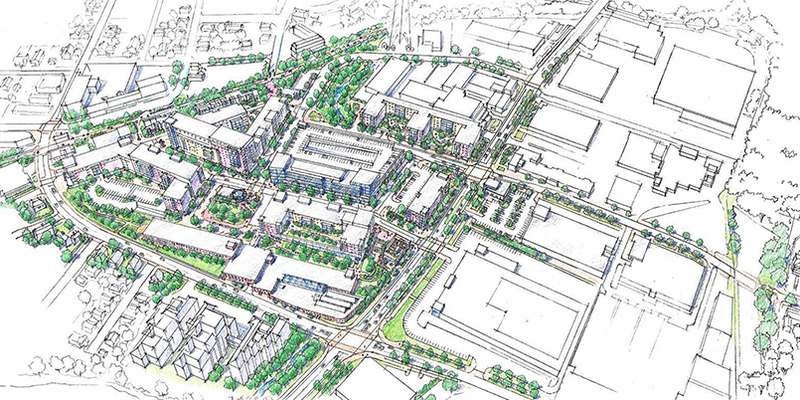 Their 30-acre masterplan for the Oak Street spur off of Needham Street proposes to bring 950 new units of housing and seems to genuinely embrace the walkable neighborhood concept. Through the latest economic cycle great progress has been made to raise the quality of the environment as part of the ongoing development boom. Time will tell if good planning and an aggregate of projects that embrace the value of engaging the street edge can stitch together Needham Street as a cohesive, walkable whole.